Uh, sorry for the delay on this one! 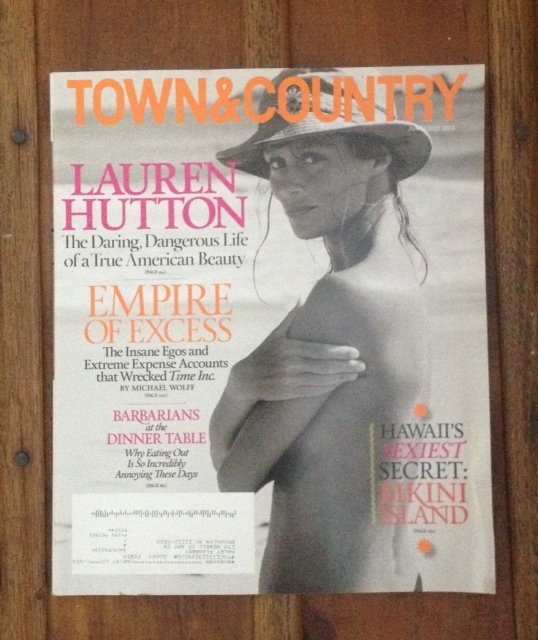 I usually like to recap Town & Country as soon as I take it out of my mailbox, but I’ve been pretty busy lately. But it probably doesn’t matter, as there won’t be a new issue until mid-July. 1. Jay Fielden, in his Editor’s Letter, talks about reading Heart of Darkness while aboard the Jungle Cruise at Disney World. 2. An entire page dedicated to gold jewelry that would look good worn at the beach. 3. The blurb about a guy who gave up his real estate job to make furniture from “reclaimed whiskey and wine barrels”. Must be nice. 4. The two engagements announced, side by side: In Miami, “LeBron James, known as King James to friends and subjects alike, proposed to his queen (an high school sweetheart), Savannah Brinson, back on New Year’s Eve 2011.” And in Luxembourg, “HRH Prince Felix of Luxembourg is engaged to heiress Claire Lademacher”. 5. From Dwight Garner’s Manners & Misdemeanors contribution on the state of table manners and service: “I like unfussy food and rustic decor: taxidermy, vintage farmhouse tables. Admiring these things doesn’t mean you have to admire rustic behavior.” Burn? 6. Deborah Harry is the featured Cancer in this month’s Horoscopes. 7. The description of Lauren Hutton as “a gap-toothed wackadoodle” in the profile “Lauren Rides Again”. 10. Cover line: “HAWAII’S SEXIEST SECRET: BIKINI ISLAND”. The fashion editorial is more tasteful than you’d expect.